Stocks Bear Market Rally is Over Mantra About to Get Busted Again? The stock market's 6 week downtrend has continued to below 12,000 to close on Friday at 11,951 which has increasingly given much fervour to the perma crowd to jump on the bear market mantra band wagon, who collectively are coalescing around the end of QE2 marking the end of the so called bear market rally, despite the fact that the past 2 years has seen one of the greatest bull runs in history of more than 100%. As has repeatedly been the case the so called bear market resumption calls reach their most vocal just as the stock bull market's most recent correction is about to end (see case studies in the Stocks Stealth Bull Market Ebook - FREE DOWNLOAD), which is what we are once more witnessing today, for when's all said and done, the Dow is barely off 7% from its bull market peak, well within the realms of a 'NORMAL' correction of upto 10%. There exists a tendency for people to over complicate investing and trading by deviating from the source by focusing on noise, and the source is not commentary concerning QE2, or QE3, or anything else that 98% of the media (both mainstream and alternative) focuses upon but rather the actual price on the charts, everything else is always only clear with the benefit of hindsight AFTER the price has moved. My strategy is simple, in a bull market the further the stock indices (Dow) deviates from its peak the more inclined I am to accumulate stocks or enter long trading positions (subject to buy triggers, always wait for buy triggers to increase probability of success because there is nothing worse than being right on trend but still losing because one was wrong on entry and stops!). Deviation from the Forecast - The Stocks Stealth Bull Market Update 2011 Ebook (FREE DOWNLOAD) culminated in a trend forecast as illustrated by the below graph that would currently put the Dow at approx 12,450 which is set against the last close of 11,954. Therefore the last price is showing relative weakness of 4%. However actual weakness is greater in terms of the overall price pattern as the stock market is still declining and yet to form a base from which to rally which may or may not be imminent, this suggests that a clear signal for the resumption of the bull market rally cannot occur until a base has been built and initial buy triggers have taken place (breaks of preceding short-term peaks and higher lows). TREND ANALYSIS - The stock market is correcting off of a new bull market high and remains within a corrective range that extends all the way down to 11,600. Whilst the stock market remains in this range it is deemed to be in a normal trend correction, i.e. holding the last significant low of 11,600 (ignoring Flash spikes) to set the scene for an eventual break above 12,876. LONG-TERM TREND ANALYSIS- The Dow continues to suggest a long-term trend trajectory towards a new bull market high before the end of this year. The trend channel is targeting an end year of year price level of between 12,800 and 13,600 with probability favouring a level nearer 13,600 and a probable breakout higher still. TIME ANALYSIS - The first leg of the bull market from March 2009 to April 2010 lasted 13 months which was followed by a 2.5 month correction. The second up leg terminated in April 2011 for a 10 month advance, which suggests a time window for a 2-2.5 month correction would extend to between late June and mid July, so most of the correction, time wise is behind us. ELLIOTT WAVES - My overall interpretation of the wave pattern remains unchanged from the March analysis (see graph) in that the Feb 2011 peak of 12,391 was a Major Wave 1, therefore signaling a major ABC trading range correction. This expected ABC trading range pattern is taking place but is not of the usual variety that would contain a lower wave B, still the trend does imply that a C wave low to complete the ABC pattern appears imminent, i.e. price is within the zone for an low of between 11,750 and 11,600 by mid June 2011 as originally expected. VOLATILILITY - No spike in the VIX yet, which on face value is bearish, i.e. implies a short sharp sell off may be pending. In terms of overall trend this suggests stocks are in for a tough month, probably a trading range of between 11,600 and 12,250. MACD - MACD has more than fulfilled the requirements for a normal major correction and is at oversold levels which suggests further downside is limited and therefore supportive of trading range with an upward bias going forward. SUPPORT / RESISTANCE - Strong support lies in the range 11,600 to 11,900 which confirms expectations for further downside to be limited. Resistance lies at 12,250 and then 12,400, 12,876 bull market high. Which suggests volatility should be more towards the upside therefore a trading range can be expected to have an overall upward bias during the next few weeks. 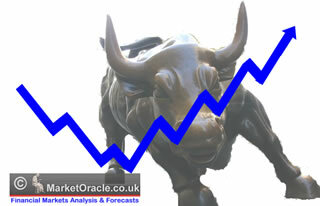 MOVING AVERAGES - The Dow appears to be targeting the 200 day moving averages which currently comes in at 11,690. Initial resistance can be expected at the 50 day, currently at 12,440. Overall this means price is converging towards touching the 200day at around 11,800, to suggest a trading range of between 11,800 and 12,250 as the 50 day falls. PRICE TARGETS - Downside price targets are resolving towards 11,700 to 11,850. Immediate upside price target is resolving towards 12,250 in preparation for an eventual break higher. SEASONAL TREND - 2011 is turning out to be the Sell in May and Go Away Year, which usually implies corrective trend into early September which therefore confirms expectations for a prolonged trading range. My overall conclusion is towards a stock market low being pretty close if not imminent, following which the stock market can be expected to spend several weeks carving out a bottom into late June / early July in the form of a volatile trading range with an upward bias in preparation for the resumption of the bull market towards a new bull market high as the stock market attempts to play catchup after a more significant but still normal early summer correction. However, the big question remains for how long will the trading range extend ? At this point in time I am leaning towards a breakout to new highs taking place during mid August 2011, but it could extend well into September. At this point in time the risks to the forecast are for a breakdown below 11,600 (ignoring intra-day spikes) which would imply an extension to the trading range for several more months. On Friday, I started the ball rolling on a series of analysis on the UK housing market to culminate in a multi-year trend forecast - (UK Property Sellers Inflated Asking Prices Risks Chasing After House Prices Downward Spiral). The UK housing market depression continues as Labours election bounce has long since evaporated, many home owners relieved that the house price crash had stopped during early 2009 had put their plans to sell on the back burner as they envisaged a return to the 'norm' of rising house prices, this expectation continued even after the coalition government took office and announced unprecedented spending cuts and tax rises during mid 2010, and scheduled to start from April 2011. Last forecast (03 Sep 2010 - UK House Prices and GDP Growth Trends Analysis) concluded in a continuing depression in the UK housing market for the next 3-4 years, with the most probable outcome being for a gradual shallow drift lower in prices over the next 1-2 years (6-12%), followed by a further 1-2 years of base building. Potential sellers who held off from selling during the election bounce of 2010, will have increasingly been alarmed by the return of falling house prices during late 2010 and into 2011, which especially has had wide regional variations in trend which is in line with local economies that are reliant on the public sector which encompasses most of the UK outside of the South East and especially cities in the North of England, Wales and Northern Ireland. However as the following analysis illustrates, most sellers are making the same mistake today that was made during the housing market crash of 2007-2009 in that asking prices for houses for sale are far above the market valuations for their properties, the result of this is for home owners to effectively chase house prices lower as they are forced to cut prices in response to falling house prices and thus in the end delaying sales as well as receiving far less than they would have originally sold their properties for if they had attached more realistic values in the first place. 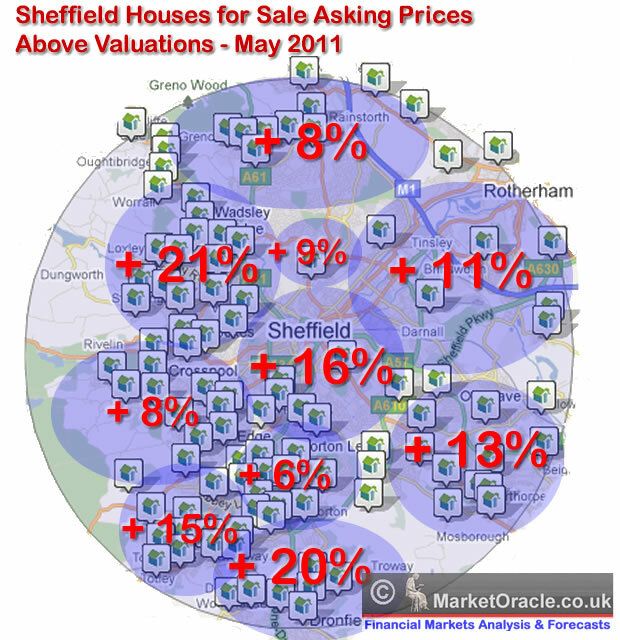 This analysis is for the North England city of Sheffield where the asking prices of 300 properties out of approx 2,500 properties for sale during the month of May 2011 were analysed against valuations obtained from a number of free property valuation sites. The analysis concludes in an overall overvaluation of asking prices of approx 13%, which is inline with what was typical during the boom years. However the average masks wide variations between areas of the city that range between properties being typically 6% over valued against 21% over valued. The over valuations where not related to either wealthier or poorer areas but rather a mix of both. 1. One possible reason why over valuations and realistic valuations tend to cluster by area's is because home sellers tend to look at what price others in an area are also selling for. 2. There may be greater competition in overvalued areas between estate agents for business therefore a tendency to give properties higher valuations so as to secure business and shut out other agents, then a few months down the road when properties have failed to sell ask clients to cut asking prices. The net result is that grossly over valued properties will fail to sell, and thus sellers risk chasing the market ever lower remaining just out of reach of buyers interest. Therefore sellers need to get multiple valuations to get a more realistic price and if their property fails to attract any interest to not delay in cutting their price by as much as 10% or more so as to attract buyer interest. Else you risk wishing you had cut earlier and thus obtained a higher final sale price. If buying do your research, look at what similar previous properties actually sold for in the area you are targeting. If a house looks fairly priced compared against others in the area then ensure that there is not a reason why it differs in price, which may be due to issues such as the property is leasehold instead of freehold, or that there is an issue for instance with flooding. Expand your analysis of house prices city wide so that you can appreciate if areas are over or fairly valued as there is a tendency for over valuations to cluster in areas as sellers tend to price according to what other sellers in an area are expecting to achieve. This analysis shows that properties tend to be over valued by an average of 13%, therefore you should aim for initial offers to be at least 10% below the asking price in most cases for cities such as Sheffield. Confirms existing expectations for a continuing depression with prices drifting lower towards new bear market lows due to over hang of supply as many sellers repeat the mistake of not valuing their property inline with what the market will bear. Ensure you are subscribed to my always free Newsletter to receive in depth analysis and forecasts in your email in box (only requirement is a valid email address). Thanks for the post. What is your opinion on the U.S. dollar in the short term? A correction rally looks pending after a long downturn, but wanted to get your opinion? You didn't mention QE3 (or lack thereof) as a risk to your analysis. It seems the market is using the end of QE2 as an excuse to sell off. So where does the potential timing of QE3 announcements fit into the bull trend equation? And more importantly - what happens if we don't hear of any confirmation of QE3 during Jul-Sep this year? 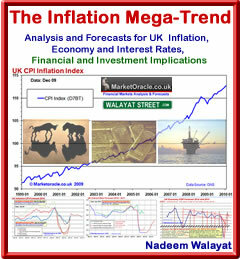 The Inflation mega-trend ebook (Jan2010) stated that once money printing starts it won't end whilst large budget deficits exist. There will be more money printing, though it may go by a different name, as ever it will be clear in hindsite. Now I could speculate on what form it will take if not called QE3, but that won't change anything because the US budget deficit remains at approx $1.5 trillion. Thanks - I definitely agree that further money printing is inevitable and I remain a medium term bull, so I guess my question is directed more at the timing and potential downside for the next few months. If the Fed doesn't announce / hint at further easing in the next few months, wouldn't this pose a real risk to any upside? Couldn't the bears use this as the opportunity to push prices down even 15% from the recent peak - and such a decline which might then serve as the catalyst that forces the Feds hand? How probably is such a scenario? I see you use elliott wave theory as part of your analysis, but I believe Dr. Pretcher has been on the talk show circuit espousing deflationist and bearish views on future market direction and that we are near a top (even though he has been stating this for over a year now). Why the disconnect between your forcast and his? for an lengthy explantion I refer you to the Stealth Bull Market Ebook section on Elliott Wave Theory. EW Theory is just a theory. It is not a Principle nor a Law so it is subjective, depending on the different interpretations of different persons looking at the charts. Worse still in the interpretation of EW is the problem of personal ego. Most EW practitioners let their personal big ego come into their way that they are blinded from reality after a while. Of course they will all tell you that they don't have a big ego. Just look at the articles on EW floating in the various websites! Precther has made more wrong calls than correct ones. Because of their marketing efforts, many people only hear of their correct calls but not the wrong ones. Read up Mark Hulbert's writings of Precther to get an unbiased idea. This is a direct quote from one of his columns: "
This helps to explain why the newsletter's timing advice for traders is in last place for performance over the last 20 years among all stock market timing strategies tracked by the Hulbert Financial Digest." 21 Jun 11, 00:41 14200 DJIA, yet you say different on 20 June ? Hello Nadeem, on 20 June 2011 your article entitled :"Euro-Zone PIIGS Greece Default Bank Run Contagion Risk - Santander Anyone" paints a very different picture to this article. Are you know saying in light of the recent developments in Europe that 14200 DJIA at end of 2011/early is 2012 is now not possible, you thoughts would be appreciated ? No, because that would mean the markets are rational when they are NOT! The news is mostly noise and not relevant to mega-trends. Are you expecting another correction in dow around 13150 level or the recent correction is enough to propel us towards 14000 level? Do you still expect £/$ to be around 1.8 level any time soon?